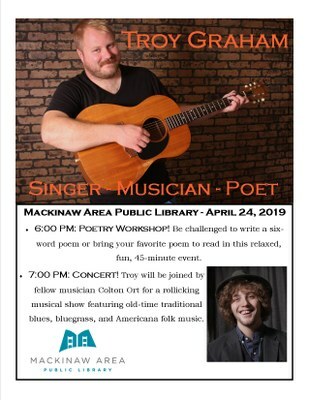 The Mackinaw Area Public Library is pleased to announce a partnership with Marquette singer, songwriter, and poet Troy Graham for a poetry workshop and folk music concert at the Library on Wednesday, April 24 from 6 – 8 PM. The poetry workshop will start at 6 PM for a 45 minute hands-on event to get the creative juices rolling again. Be challenged to write six words poems. Hear readings from other artists. Feel free to bring your favorite poems to read and celebrate National Poetry Month in this relaxed, fun manner. The concert will begin at 7 PM and will feature Graham and fellow Marquette musician Colton Ort sharing a love of old-time traditional blues, bluegrass, and Americana folk music. This inventive duo brings a different approach to the blues, as well as keeping the old-time traditional sound in mind for a rare, almost comedic, musical show.